For a long time, what we really wanted to hang in our home, but never had the guts, was a picture wall. It’s not just scary; it’s intimidating. With a picture wall, we’re not just talking about making a few holes in the wall, the prospect also includes finding the right frames to work together. Even more nailbiting is creating the perfect layout that balances the pictures artfully and naturally. But we did it! And we LOVE the results. The process was crazy simple once we found The Perfect Picture Wall. Order one package and receive 10 matching frames with mats (select from 2 or 1 inch frames in a variety of colors.) So that takes care of a big part of the intimidation–now you have matching frames. There’s more. 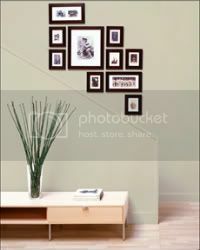 The Perfect Picture Wall comes with several templates (save the extras incase you move!) The templates can be used vertically, horizontally, or even cut and used in a stairwell. We hung our template (its a huge piece of paper and comes with non-permanent sticky stuff) a few ways in a few places before deciding which way worked best for our family room. So, after deciding where and how we wanted to hang, we attached tiny levels to the corners. (The levels were included as well. I’m telling you–its everything you need in this super box.) After that, we just stuck a tack through the dots that signified where our nails would go, took the template off the wall and hammered in the nails. Just a few minutes later, all the frames were hanging on the wall. And we were left with an amazingly perfectly professional picture wall that drops mouths. Here’s a bonus, because we’re slackers that didn’t select the pictures first, The Perfect Picture Wall comes with floral and natural pictures already inside (they say this is for office use, but I know its really for lazy moms who didn’t print out pics yet). Explore their website and see what its all about. You’ll be amazed at how absolutely simple and fast the system is. While you’re over there, check out Today’s Special Value, which just may have the exact kit you need. Or use code MOMMIES20 for 20% off your purchase. And they’re offering free shipping right now. Add The Perfect Picture Wall to your hoilday wish list. I’m telling you, you want this. I love this – it’s something i’ve always wanted to do too. i’ve tried a couple of times but never seem to get it quite right! This product looks so great, but I tried the coupon code and it says it’s already expired. Any chance they’d reissue the coupon code? I would love this! I tried the coupon code as well and I wanted to know if they would reissue the coupon?? I would order it right away if they would. Seems like the coupon expired. Do you know if there is an update coupon? I’d like to order 3 sets and 20% off would be great! Ok, so I just used this and it still works. Love it. I have been ogling over these for years. Thank you so much. Do you have this available in white frames?